Wholesale Club Flyer March 22 – April 11, 2018 – Find the latest weekly flyer for Wholesale Club. Also, keep your challenge with coupons and great deals from Wholesale Club. 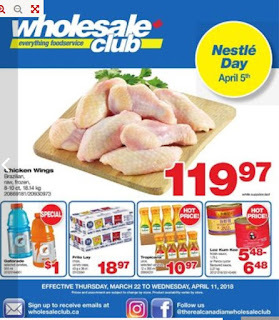 Wholesale Club is a chain of warehouse clubs owned by Loblaw Companies with locations across Canada. Product Such as Bakery, dairy, deli, frozen foods, gardening centre, general grocery, photolab, general merchandise, pharmacy, meat and poultry, produce, seafood, snacks. Low price in every day for people who visit Wholesale Club, and there are a special great deal in Wholesale Club product. For more details about Wholesale Club flyer, you must visit the official website here. You must enter a zip code or state to see for more information Wholesale Club. Thank you for visiting this site.